Made for modern doors - versatile, elegant, adaptable - this Crystal Round style door knob set comes complete with a modern square style rosette. 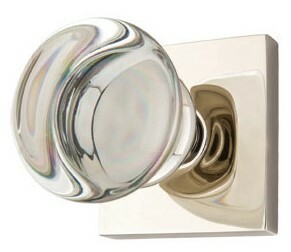 This knob set with fit any door thickness between a standard 1 3/8 inch to a 2 1/4 inch thick. The Rosette or back plate is a square and it measures 2 1/2 inches on each side. Functional sets come complete with the functioning hardware and a 2 3/8 inch backset is standard. A 2 3/4 inch backset is also available upon request. Shown in Polished Chrome, it is also availble in Oil Rubbed Bronze, Flat Black and Brushed Nickel.